We decided to leave Lavacolla early, to get ourselves the best chance of making the midday mass in Santiago. Given this is Pat’s first Camino, we wanted to be able to have the opportunity to go to as many masses as possible, so that at least she’d have a chance of seeing the Botafumeiro swing. We actually got up at 5:30 am, as breakfast in the hotel was served from 6. The aim was to be on the road by 6:30 or 7 am, as given it was 10 kilometres still to go, and with Pat’s injuries, I estimated we’d needed a good 4 hours to get there. We were on the road at 6:45 am when it was still dark, so we were wearing headlights so that the cars could see us on the road. 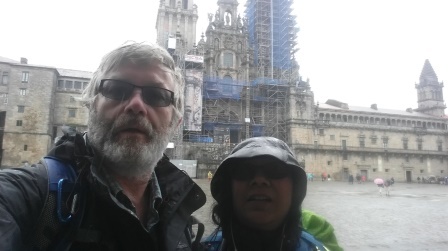 Also today there’s forecast for rain so we had rain all the way to Santiago. With the rain jackets and pants that we had, we were perfectly dry all the way, but one unforeseen disadvantage of walking in the rain, is that for ladies, it is difficult to hike off into the woods to go to the toilet. Although we did manage a couple of stops on the way. Unfortunately, most of the cafes were not open, so that made it a little bit more inconvenient. Because of the rain and the cooler temperatures, we made a very good pace and we’re heading about 4 kilometres and hour, so we hit Monte do Gozo by about 8 am. There we did the traditional photos with the pilgrim statues and visited the small chapel. With only 5 kilometres to go, we set off at a fair pace to head down then into Santiago. The last 4 kilometres of course is through the outskirts of Santiago before you reach the old city, and that is quite a challenging walk, after walking through beautiful eucalypt forests and woodland. Those final kilometres just seem to go on forever and ever. But by about 10:45 am, we reached the Cathedral, took some photos and then immediately went down to the pilgrims’ office to see if there was much of a queue. Of course the pilgrims’ office is now relocated to a road which is off behind a parador. People were telling us that there was quite a queue so we decided to leave it ’til later, to go and check in to our hotel and then make it to the pilgrims’ mass at midday. We got into the Cathedral at about 11:30 and of course, along with everyone else, we were wondering: will we see the Botafumeiro swing? As always, the mass is quite a moving experience and Pat hit first time lucky, she was able to see the Botafumeiro swing at the midday mass. Later in the afternoon we decided to head down to the pilgrims’ office and collect and collect our Compostelas, the new office is certainly a great facility, though we did end up still queuing for two hours. Having had a delicious lunch, we then decided to do a little bit of shopping before heading off to the evening mass at 7:30 pm. We made sure that we got there early at about 6:30 pm so that we could get seats. Again, a very moving experience with some beautiful singing by one of the Cathedral nuns. And yet again, Pat got to see the Botafumeiro swing. In fact she scored a hat trick, we went to mass three times overall and the Botafumeiro swung three times. All that remains is to do a little bit more shopping in Santiago on Saturday, collect a few souvenirs, enjoy some of the fantastic food that’s available, before we head out on Sunday.